You know that the colonial masters of old love to live it up, living in huge bungalows with sprawling grounds, not to mention having plenty of servants to dote on them with each step that they take, enjoying some time off for afternoon tea while chit chatting with their family and friends as the world goes by. For those who have a ballroom, something even better and more opulent is affixed – the chandelier, and if walls (and other fixtures in a home) could talk, I can just imagine the kinds of conversations that the aged chandelier has recorded over the years. Modern day mansions, too, do have chandeliers of their own. The question that owners of such cribs should ask themselves is this – do you need a chandelier in your home, and if you have answered “Yes”, is it going to be green? I suppose that is a valid question, considering the amount of environmental awareness that we are bombarded with each day in this age. 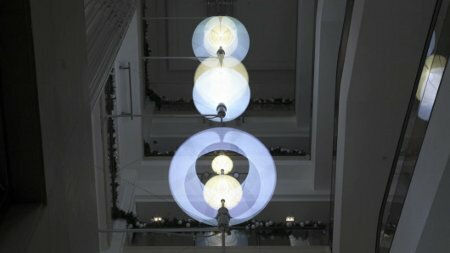 Well, for folks who want an environmentally friendly chandelier (relatively speaking, of course), design firm Troika might have just the thing for you – the LED chandelier known as Thixotropes. Yes, it can be quite a mouthful to pronounce, but it is not only easier on your wallet where your monthly power bill is concerned, it is also a joy to behold as well. The Thixotropes from Trokia is a mechanized, kinetic wonder of its own, delivering a beautiful vision of the lighting of the future. If you want to get all technical, the Thixotropes is not actually a singular entity, but rather, is comprised of eight “mechanized systems” which include carbon, steel banding and LEDs that have been combined into chandeliers under two meters (around 6.5 feet) in diameter. Would you get one of these for your home?